This tool allows you to calculate your hours of work by the day. It automatically adds time ranges from which you have entered the start time and the end time. Enter as many tracks as you want. A work day can begin before midnight and end the next day. You can also add durations that you have entered directly. For example, add your weeks to get the monthly total. A module allows you to perform time subtractions. Your hours or durations are entered in hour-minutes format and the result is given in hours-minutes (sexagesimal format) and hours-hundredths of an hour (centÃ©simal format). This table will allow you to complete and edit a weekly timesheet. 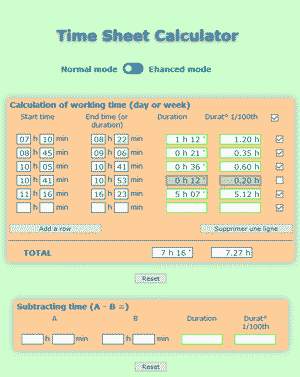 In the same way as the previous calculator, you enter your hours day by day. The total appears at the bottom of the sheet in sexagesimal and centesimal hours. Your daily entries are saved until you perform a reset. 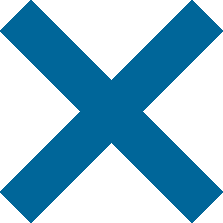 - For a day, you add as many time range lines as you want. - You can hide or show a line, a day, in the final result. The dates and number of the current week automatically appear. 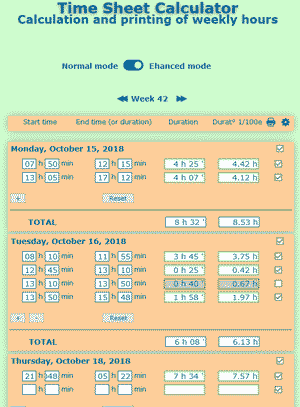 You can choose to enter your hours for a previous week using the scroll arrows. A printable version is available.